I present to you yet another example that disproves the conventional wisdom that “one can’t teach an old dog new tricks.” I had another one of my “eureka!” moments this week while researching eclectic styles in architecture. I came across images of Blaise Hamlet which is outside of Bristol, England, and let’s just say I wanted to crawl right into my computer monitor. What charming architecture! AND, it was built to house retired folks, this at the beginning of the nineteenth century! An early form of assisted living – I think so! So not like warehousing people in nursing homes. 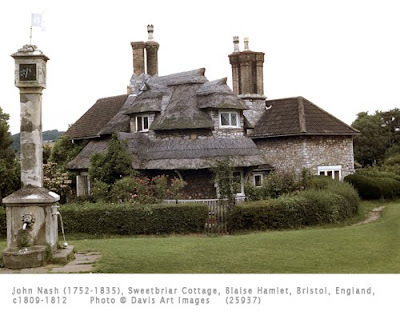 Aside from the fascinating fact that Blaise Hamlet was an early form of assisted living, it also is a highlight on the little known element of Romanticism known as the Picturesque style. The Picturesque style emerged after the publication in 1794 of Sir Uvedale Price’s (1747-1829) book Essay on the Picturesque. The word “picturesque” comes from the Italian pittoresco which means in the manner of painting. Price’s ideal of natural beauty was associated with the carefully contrived landscapes of such Baroque painters as Claude Lorrain (1600-1682 France) and Salvator Rosa (1615-1673). Uvedale’s book essentially emphasized a middle ground between urban design and landscape, although the style eventually took on anti-urban tones. John Nash designed Blaise Hamlet for the retired workers from Blaise Castle estate at Henbury. Blaise Castle was owned by John Scandrett Harford (1785-1866), a wealthy banker and Quaker abolitionist. Nash’s design for Regents Park and Saint James Park in London are an example of the synthesis of the urban/rural trains of thought, while Blaise Hamlet emphasizes the rural “sublime.” One of the key aspects of the Picturesque was the “pleasing” harmony of buildings and landscape, and the “appropriate” proportions of landscape to architecture. In architectural terms, Blaise Hamlet is a good example of the Picturesque, freeing architecture from the tyranny of symmetry (of the classically inspired Baroque architecture). Looking at Sweetbriar Cottage conjures up ideas of variety, irregularity, asymmetry, roughness of texture, and a romantic harking back to medieval cottages. The Picturesque style was a huge influence throughout Europe, and, in architecture, led to the eclecticism of many revival styles in the nineteenth century, particularly Gothic.